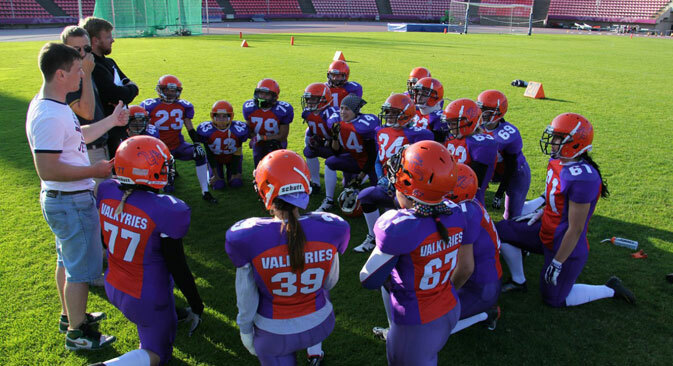 The St. Petersburg Valkyries hope to someday play in their own version of the Super Bowl. When the Seattle Seahawks take the field against the New England Patriots in Phoenix on Feb. 1, the St. Petersburg Valkyries will be asleep, some 10 time zones away. But the 18 members of this all-women’s American football team hope that someday they will also be playing in a similar high-stakes game. In 2011, Igor Golubev and Alexander Sokolov, who play on the St. Petersburg Griffins American football team invited some of their female friends to try the sport out. One of them was team captain Alexandra Mansurova, now 23. Baseball: The great Russian pastime? The Valkyries practice in a closed pavilion on the outskirts of St. Petersburg. According to Mansurova, the point of the game is not just to run and crash into each other; the team works on a variety of defense techniques. Sometimes the Valkyries play against men’s teams. Mansurova said that it’s tough, but the practice makes matches against other women a lot easier. Mansurova has a teaching degree from the Herzen State Pedagogical University. The team also boasts an accountant, a marketing manager and some trainers at fitness clubs, but most of the players are college students. Twenty-five-year-old Virineya Yatsyna has been playing for the Valkyries for two years. She decided to start playing after watching a Griffins game. Professional women’s football began in 2004 in the United States, with the Lingerie Bowl, a PR stunt featuring women in lingerie playing football that took place during the Super Bowl halftime show. In 2009, the game expanded into a 10-team league. In 2013, the league changed its name to the Legends Football League, although the women continue to wear uniforms that are little more than underwear. The league also has teams in Australia and Europe. Ilya Kravtsov, who has been coaching the Valkyries since last spring, is working hard preparing for a Russian championship in American football for women. “Our girls from St. Petersburg can play with their neighbors from Finland, while teams from the Urals or the Far East, for example, don’t have that opportunity. If there is no one to compete with, there is no incentive to develop. That’s why I think we need to have our own championships in Russia,” Kravtsov said. There are about 20 women’s teams of various levels in Russia, only five of which are sufficiently trained to participate in a championship, according to him. Kravtsov also wants to create a national squad to take part in the 2015 European championship, which is scheduled to take place in Finland. Kravtsov is actively establishing contacts with the rest of the Russian women’s football teams to recruit the best players, and has organized a crowdfunding campaign to raise funds for the team. Kravtsov said that he has been accused of not being a patriot for coaching American football, but he considers sport above politics. “This isn’t just a problem with women’s American football, but for American football in general in Russia,” Kravtsov said.